Bantu Rovers FC is more than just a football club in that it invests considerable time and effort in developing its players not just as footballers, but as influential members of the community. Bantu Rovers FC instills life skills such as teamwork, leadership, discipline, resilience, communication, and confidence in its players, coaches, and management team. To learn more about Bantu Rovers FC, and their partnership with Grassroots Soccer, check out the links below. We hope you’ll join us at our first “Open Play at the Park” which is coming up soon! We’ll have lots of fun toys, games and equipment from the Parks Dept and other treats at this free pop-up event. PLEASE SHARE: DOWNLOAD|PRINT EVENT FLYER! The COMMUNITY FEST, presented by SOCCER CONNECTS and XrCEL, along with CharlestonGOOD, 3 Brothers Education Network, and the Friends of Charleston Greenspaces, is a unique program designed to get more inner-city students to come to an elite college campus. The event will feature hands-on activities, campus and museum tours, and a one-time screening of PELADA, an amazing film. This free community event will appeal to people of all ages and backgrounds, so please attend, and help spread the word! “While PELADA may be regarded as a film about soccer, it is really much more. This is a film about perseverance, love of a game, love for one’s friends – and for strangers, too. This film is a behind the scenes look not only at football – soccer – but at the lives of ordinary people around the world. This movie calls one’s attention to one’s values, and doesn’t preach about what those values should be. To a great extent, this is a film about the need we all feel for play. Seeing women in Teheran “playing” is bound to make one think about the effect of religion and politics even on such a basic human desire as the need for play. Soccer Connects is a Lowcountry-based social enterprise committed to fostering positive personal and community development through a shared love of the beautiful game. XrCEL, developed here in Charleston, is an extended release carbohydrate supplement, delivering fuel how and when your body needs it. The Charleston Battery recently released two new shirt designs which are part of a new “Athentics” line of merchandise. For more details on the “Jolly Cannons” and the “Classic” designs fo 2016, click here! The City of Charleston Parks & Recreation Department wants to hear YOUR story! They are currently seeking submissions from members of the public and employees of the City for their #IGrewUpInRecreation campaign. We think this is pretty cool! College of Charleston students took to Patriots Point field recently for a friendly match of bubble soccer, the latest hybrid sport that’s spawning leagues and playing facilities around the country. The players looked like a bunch of translucent pumpkins with legs, bouncing off of each other and struggling to stay upright in their air-filled “uniforms” as they kicked a soccer ball up and down the field. The event, organized by the Cougar Activities Board, took place on Sept. 25, 2015. 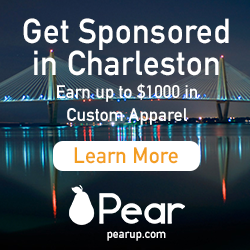 Find a Sponsor for Your Team with PEAR! Soccer Connects is excited to announce a free fundraising opportunity coming soon to teams and organizations in Charleston, SC. PEAR is a marketing platform that connects local adult and youth soccer teams (and other groups) with national sponsors in order to help groups raise money for FREE! It is really simple to set up a campaign for your group and even easier to start raising money for custom uniforms or other gifts and awards for your organization or team. Pick a sponsor that best suits your group’s needs. Rally your supporters to paticipate in your campaign for free by performing quick and easy tasks online (like watching a short video clip from your sponsor). To get started, register your group for free.